I started this post several months ago, and hadn't finished it. With announcement of of Apple's new Airpods, I'm getting asked more about wireless headphones, and this will serve to summarize my experiences and recommendations. I hope it helps you! The first question is of course "Why?" Why bother with wireless headphones when there are plenty of serviceable, inexpensive wired ones? 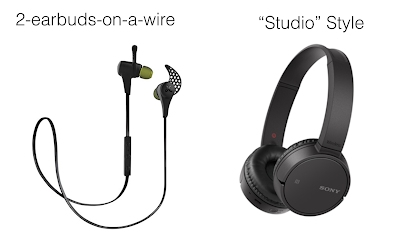 The headphones style are great for throwing on quickly, and their size means battery life is great - 5 hours to 30 hours of playback on pairs I've tried. Controls on the ear piece, which is large enough to operate easily. I find the two earbuds style vastly superior to the single earbud "cyborg-style" that have been popular with real-estate agents and the upwardly mobile for making calls for years. The two earbuds hangs easily around my neck, so I can use them and remove them without having to stuff them in a pocket. This means I always have them with me - my first wearable device. Full iPhone support - I've found battery status is not always supported, and it's a great feature to have. To be able to just look at your phone and know how charged your earbuds are. Standardized forward & back controls. Standardized call button controls to trigger Siri. The ones I recommend are the Jaybird X2. Although they are pricey (about $200 Canadian), the 8 hour battery life is unmatched, the sound quality is good for music as well as talking & podcasts, and the controls are consistent and well built. Other cheaper versions I tested (about 5 pairs!) were just not as good on all these dimensions. Jaybird X3: I have also now tried the Jaybird X3, and immediately returned them. The have a proprietary connector that attaches to the microphone & volume adjustment. If you lose the adaptor or are not where you have the adaptor, you can't charge them. This was a show-stopper for me. They also made the microphone & volume buttons larger and heavier - which seemed significantly inferior to me. Apple Airpods: I have also got a pair of the Apple Airpods now too. I've had them for about 6 months, and the are very good. The easy use & switching between mac, iPhone, and iPad due to their "W1 Chip" is a huge win, and while I can quibble about how well it works a bit, it's really great. The lack of wire to connect the two is an issue for me, as described above. It's a win for simplicity, and makes the case possible, which is also a hugely important win/part of the product. That said, the lack of joining-wre also takes away from the jobs it does for me. One key place is on my bike. I find that my helmet straps knocks them out of my ears, and they fall off - a show stopper for biking, so I don't use them for that case. I also choose the Jaybird X2 for my every day use at work, due the joining-wire that means I can more quickly pop them out of my ears, let them dangle, and then tuck them into my shirt. I know, I know - first-world problems - but these are the details of my everyday experience with the various types. Thanks for reading & my best to you!